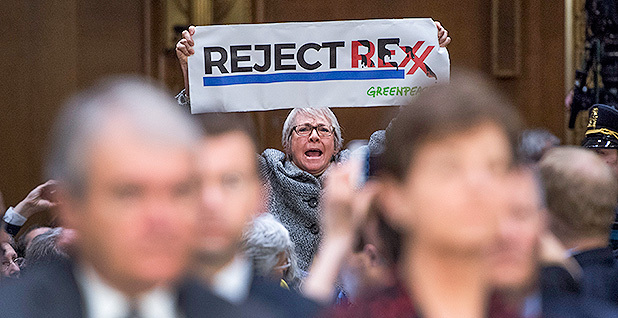 A protester disrupts the Senate Foreign Relations Committee confirmation hearing for secretary of State nominee and former Exxon Mobil Corp. CEO Rex Tillerson yesterday. Photo courtesy of AP Images. Former Exxon Mobil Corp. CEO Rex Tillerson made recovering American leadership the theme of his secretary of State confirmation hearing yesterday, but he argued against the United States getting out ahead on climate change. The veteran oilman told the Senate Foreign Relations Committee that the Obama administration's meek stance on issues ranging from the Middle East peace process to Russian aggression has compromised U.S. power. But when it comes to global engagement on warming, he said, America should stay near the middle of the pack. "I think it's important that the United States maintain its seat at the table in conversations around how to address the threat of climate change, which do require a global response," Tillerson said. "No one country can solve this alone." In a day dominated by questions about Exxon's dealings in Russia and Syria and Tillerson's own conflicts of interest, global warming still loomed large. Environmentalists gathered outside the Dirksen Senate Office Building wearing inflatable T-Rex costumes, and four times throughout the marathon hearing, activists interrupted to accuse Tillerson personally of abetting climate change. One woman chanted "Rex Tillerson, look at me. My home was destroyed in Hurricane Sandy," before security escorted her from the hearing room. Tillerson, for his part, did not deny global warming — he told lawmakers "the risk of climate change does exist" — but struggled throughout the day to clarify his views on accepted science surrounding humans' contribution. He shed little light on whether Exxon ignored decades of climate change research and equivocated when it came to questions about whether the United States would remain within the landmark Paris Agreement. Pressed by lawmakers on whether he would fall in line with President-elect Donald Trump's campaign goal of scrapping the 2015 climate accord, Tillerson promised only that his boss would conduct a "fulsome review" of President Obama's legacy. "There's an important consideration to this; if we commit to this course that is executed over time, are there any elements of that that put America at a disadvantage?" he said. Tillerson later said the Trump administration would pursue an "America First" policy when deciding whether to provide funds to the U.N. Green Climate Fund, which helps poor countries cope with climate change. That is, U.S. interests would dictate whether the new administration will provide the $2.5 billion balance toward Obama's pledge of $3 billion toward the fund by 2020. "My expectation is we're going to look at all these things from bottoms-up in terms of funds we've committed to this expert," Tillerson said. Sen. John Barrasso (R-Wyo. ), who had sought an assurance that no more American money would go toward that fund, later told E&E News he was satisfied with the answer. Tillerson was less cautious when it came to enforcing national security abroad, an area in which he proposed the United States take a muscular and sometimes solitary approach. He repeatedly prescribed that the United States operate "from a position of strength," setting boundaries for adversaries and retaliating if they overstep them. Had Obama done more to push back when Russia annexed Crimea, he said, Russian President Vladimir Putin would have adopted a less aggressive stance against Ukraine. And a more effective offense could have routed the Islamic State group, he added. Instead, moves like Obama's failure to enforce his "red line" on Syria, in which he promised to intervene if the government used chemical weapons but then did not make good on the pledge. "American leadership must not only be renewed, it must be asserted," Tillerson said. But Democrats on the panel said that by hinting that the United States would take a backseat role on Paris, Tillerson was abdicating U.S. leadership in an area that a wide range of countries care about. "I haven't heard anything yet that indicates that he understands the enormity and the magnitude of the challenge and that the U.S. needs to lead the world in taking it on," said Sen. Jeff Merkley (D-Ore.). "We are not just any country. We cannot be a laggard," Sen. Ed Markey (D-Mass.) told Tillerson. "To the extent to which we withdraw, then it undermines our ability to lead on many other issues, as well," he told E&E News during a break. Just what Tillerson intends to advise Trump on Paris if he is confirmed remains unclear. At least three times during the daylong hearing, he said U.S. interests are best served by being "at the table." That could mean he would propose that the United States remain a party to the agreement among 195 countries to curb greenhouse gas emissions. It might only mean advising against a more drastic option floated by some hard-liners to pull out from the underlying treaty, the U.N. Framework Convention on Climate Change. If that happens, the United States and North Korea would be the only nations that are not parties to the body. Tillerson testifies yesterday before the Foreign Relations Committee as lawmakers debate his appointment to be the next secretary of State. Photo courtesy of C-SPAN. Under Tillerson, Exxon supported the Paris Agreement and reiterated that position as recently as Nov. 4. He told Democrats yesterday that he supports the deal and feels comfortable sharing his views with Trump. Senate Republicans are generally united against the agreement, complaining that Obama joined it inappropriately by skirting the chamber's advice and consent authority. But none asked Tillerson yesterday to clarify his own support. Sen. Jim Inhofe (R-Okla.), who considers climate change a hoax, said after the hearing that he was not concerned Tillerson would try to change Trump's mind about withdrawing from the deal. "Well, what do you expect him to say at a confirmation?" he said in response to questions about Tillerson's desire for a "seat" on Paris. "I learned a long time ago that when you're in a confirmation hearing, you don't really believe everything you hear. Wait and see what happens. I think I know what his feelings are, and I feel comfortable with him." The apparent lack of concern about nailing down a position on the Paris Agreement appears to be catching on among many Republicans and some conservative analysts, though others remain determined that the United States leave. The deal does not feature any consequences for noncompliance, and the only legally binding elements are procedural steps related to reporting and transparency. And opponents say remaining in it does, as Tillerson noted, give the United States a say. "It is important to maintain pressure and a role in the international climate process," said Frank Maisano of Bracewell LLP. "If not, we will face proposals that are completely irrational." Environmental activists warned that the world doesn't want to see the United States stay in the Paris deal without contributing anything meaningful to it. "One thing is for certain, with Rex Tillerson, our nation is at strong risk of ceding the mantle of U.S. leadership on climate," said John Coequyt, the Sierra Club's global climate director. "He's proven time and time again that he will put the profits Exxon makes off the dirtiest fossil fuels over the health and safety of our communities." 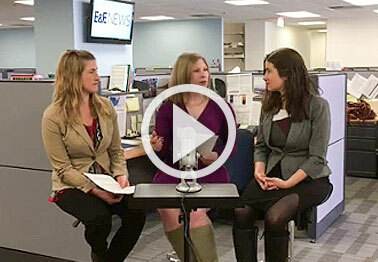 E&E reporters Jean Chemnick and Hannah Hess detail the highlights of Rex Tillerson's confirmation hearing to be secretary of State — with E&E's Monica Trauzzi. Click here to watch the video. Tillerson did seek to allay fears on one issue. 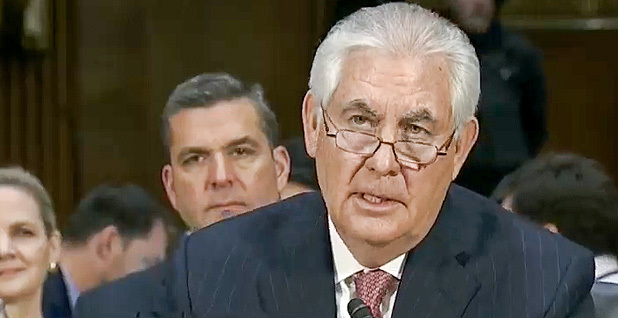 Asked by former vice presidential candidate and Sen. Tim Kaine (D-Va.) and Sen. Jeanne Shaheen (D-N.H.) about Trump transition memos inquiring about personnel who have worked on climate change and women's issues, Tillerson said his State Department would not persecute those who worked on such issues under Obama. "No, sir, that would be a pretty unhelpful way to get started," he said.